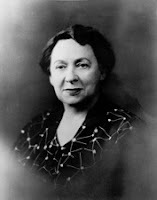 ... 1892 (120 years ago today), Eva Kelly was born in Nevada, Missouri. After marrying in her mid-30s, Eva Bowring (left) and her husband worked the Bowring Ranch in Nebraska. 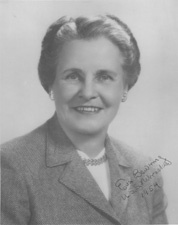 She became active in politics, serving as the vice chairwoman of the Nebraska Republican Central Committee and director of the Women’s Division of the Republican Party in Nebraska from 1946 to 1954. 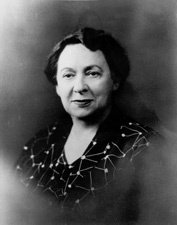 On April 16 of that latter year, she became the 1st woman to represent Nebraska as a U.S. Senator, having been appointed to fill a vacancy caused by death. She did not run for election; thus, in November of that year, she became the 1st woman Senator to be succeeded by another woman -- Hazel Abel (right), who herself would resign just a month later, and so make way for the man who would hold the seat for nearly a quarter-century. (photo credits here and here) Bowring, meanwhile, served on the National Advisory Council of the National Institutes of Health and as a member of the Board of Parole of the U.S. Department of Justice. She died in 1985.